Last year, we got into some bad habits. If you’ve been following me for awhile, you would have read my story about when my husband lost his job and we moved in with my parents. I am so, so grateful for the generosity that my parents showed, but when you aren’t living in your own space, it’s hard to set boundaries. Even hard to keep things normal sometimes. I think I had a mindset that things were just temporary, and I just needed to do what I needed to do to get by. To bide my time. So we started doing things like having cereal for breakfast every morning. Eating too many snacks. My son developed a chocolate milk addiction. And he also became a very picky eater. When we moved last November, I made a promise to myself. To my family. That our ways would change and we would get back on track with what we were eating. Well, then there were more excuses. 🙂 We had just moved – things were a mess. I was working crazy hours and was so tired in the mornings that I didn’t have the energy to make breakfast, so cereal it was. I guess that’s why they call them habits. And sometimes, they are hard to break. We have been taking baby steps, which is sometimes the only way to go when you have a small family. But one of my biggest things that I wanted to improve was that I wanted to get my kids to love vegetables. But that can sometimes get difficult when you are in the dead of winter. Sure, there are veggies at the grocery store, but how are you supposed to love something that doesn’t taste like anything? That’s what I think about most produce you can find in the winter – especially tomatoes. 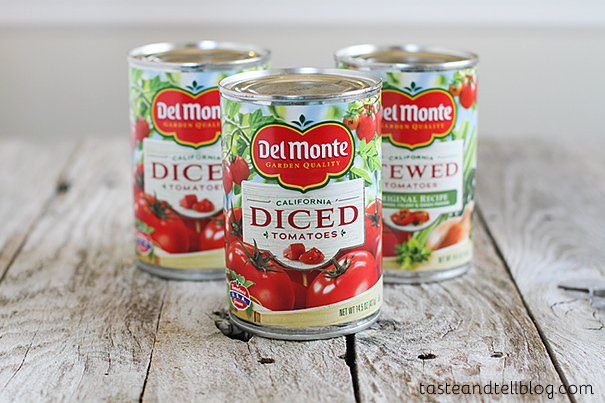 Enter Del Monte® canned tomatoes. Seriously. These things are lifesavers. Not only are they canned from tomatoes that are picked at their peak of ripeness, but the majority are canned the same day they are picked. You can’t even get fresh like that when it’s prime tomato season! Plus, 95% of Del Monte’s fruits, canned tomatoes and vegetables are preservative free. By stocking your pantry full of canned fruits and vegetables, you have a garden in your pantry with great products just waiting to be used. 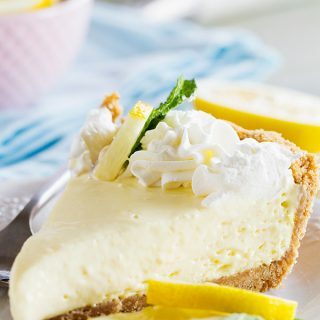 For recipes and information about Del Monte, make sure you are following them on Facebook!! If there is one thing that my kids can’t leave alone, it’s when mom or dad are dipping chips into anything. And salsa (as long as it’s not too spicy) is one of their favorites. During our move, I came across a piece of paper with a version of this recipe on it that I had been given from some girls at church. The youth were doing a fundraiser and selling salsa, and luckily, they handed out the recipe as well, because the salsa didn’t last long at all. 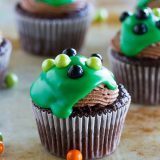 So when I came across the recipe, I knew I needed to make up a batch for my kids and I to share. I love this salsa recipe because it’s perfect year round, and it literally only takes minutes to make. I also decided to take the healthy-factor one step further and bake some of my own tortilla chips. 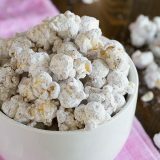 I love this method because I can make just as many as I need, and I don’t have to worry about a whole bag of chips, sitting in my pantry and tempting me. 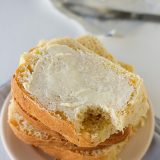 I like to make these simply with some coarse kosher salt, but they are great when you sprinkle them with spices as well. 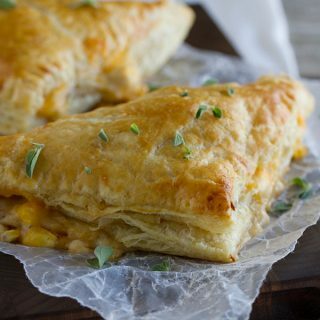 Now this is a healthy snack the whole family loves! 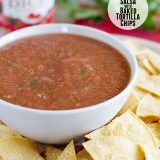 It doesn’t get much easier than this Quick and Easy Salsa! Pair it with these Homemade Baked Tortilla Chips for a healthy snack. Combine all of the ingredients in a blender and pulse until you reach the desired consistency. Arrange the oven racks in the top third and bottom third of the oven. Preheat the oven to 350F. Lay the tortillas out on a work surface and brush with oil. Sprinkle with salt. Stack the tortillas, then cut the whole stack into 8 wedges. Arrange on 2 baking sheets in a single layer. Place the chips in the oven and bake for 7 minutes, then rotate the trays and bake an additional 7 minutes, or until the desired doneness. * Remove from the oven and allow to cool before serving. 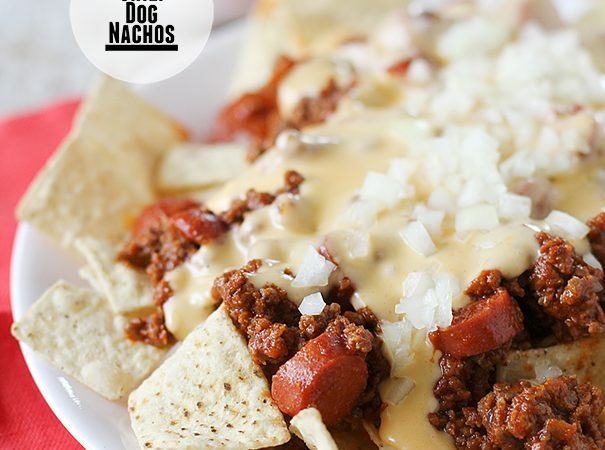 *The chips can go from underdone to overdone very quickly, so keep an eye on them. Take them out of the oven when they are still a little pale, as they will continue to brown a bit as they cool. Canned tomatoes, corn, string beans and pears. This salsa sounds soooo good!! Love this! I like to stock canned tomatoes, kidney beans, corn and pineapple. I always love a good salsa. This looks fabulous! 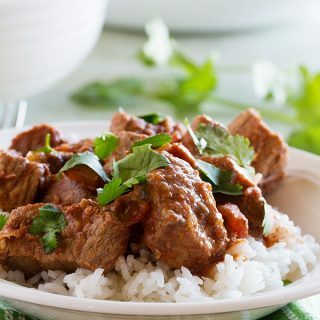 Love this recipe using Del Monte tomatoes. tortilla chips, canned tomatoes, frozen cilantro and garlic powder. I make a quick salsa with it. 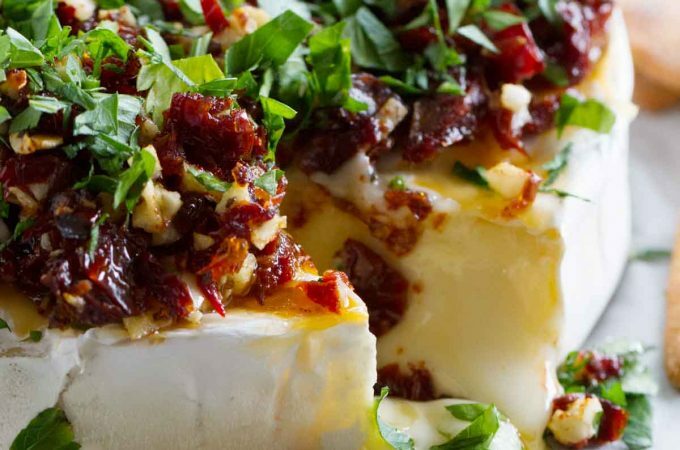 I love restaurant-style salsa and this looks perfect! I always keep canned corn and green beans stocked. I have canned diced tomatoes in the pantry. Wouldn’t want to go without and of the many types of fruits and veggies I keep on hand but if I had to never give up one it would be tomatoes. I love adding them to all types of meals. We always have tomatoes, pineapple, peaches and lots of varieties of beans. Thanks for the giveaway! peaches, pineapple, and mixed fruit in my kitchen pantry. Yes..habits are certainly hard to break. Glad you are back on track! I keep canned tomatoes, green beans and peaches on hand. I think we’ve all been there, so I totally applaud you for making small changes to get to where you want to be! Those are the only kind that really work in the end, anyway. LOVE this salsa! What better way to get more tomatoes into your lives!? I stock up on canned peaches, pears, corn, strings beans , baked beans and diced tomatoes. I like to stock.freeze cherries. I always keep diced tomatoes, baby corn, and lots of kinds of beans in my pantry! We have peas carrots corn and lots of tomato products. The always come in handy. we like sweet corn and peas. but we also love juicy pineapple! i usually have corn, tomatoes, tomato paste, green beans and peaches. Canned carrots, peas, corn and pineapple tidbits. I always have onions, potatoes, sweet potatoes, squash, tomatoes and cucumbers on hand. My daughter likes fresh veggies for snacking. First of all, this salsa sounds awesome! Homemade versions are definitely the best. I love stocking up on sweet corn and green beans! I love to keep canned peaches and whole potatoes, they are great for making breakfast potatoes! I always have garbanzo beans, black beans, diced tomatoes, and tomato paste. Such an easy salsa recipe!! We always keep diced tomatoes on hand for this specific reason. 🙂 And I can definitely relate to getting off track and using excuses…especially during transitions in life. Glad you’re getting back to good habits!! My favorite fruits to have in my pantry include applesauce and pears, and I like canned light red kidney beans. I love love love salsa! I could eat it all day, every day because I love tomatoes and I love the different varieties you can make with a few simple ingredients. Cheers to you and your family for getting back on track for 2014! I am always looking for a new classic salsa recipe to try, Deborah! 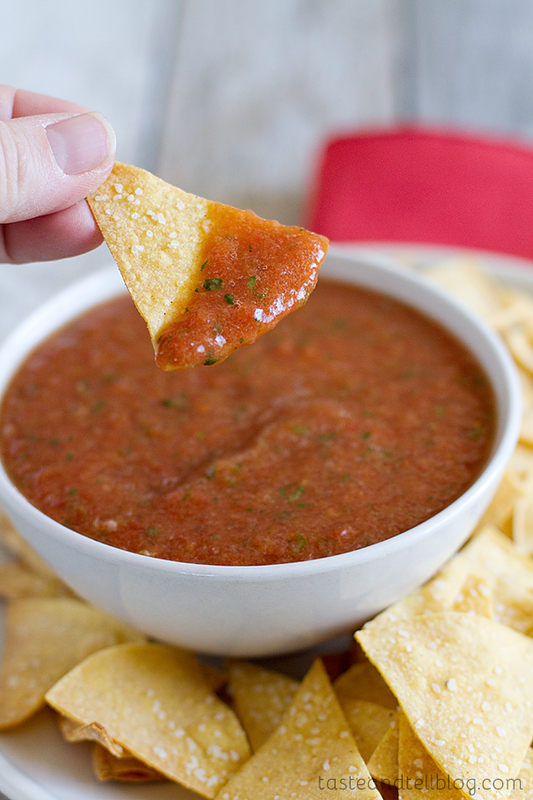 Chips and salsa are my weakness. We go out for it a lot… and yes, we also make it at home a lot. We’re hooked. Here’s to one amazing 2014 for you and your family! This sounds awesome. I will try it. I love this – exactly the texture I love salsa to be for my kids to eat it too! Habits ARE hard to break – good for you for putting in the effort! Mandarin Oranges and tomato’s are always in my cabinet. we loved, peas, carrots, pineapple, tangerines and peaches. canned pumpkin, canned green beans, & lots of dried fruits! As long as I have canned tomatoes and diced green chile’s, we’re good. ALWAYS. I keepl ots and lots of tomatoes. Also onion and garlic. We always keep green beans, peaches and pears in the pantry. Blueberries, broccoli and cauliflower in the freezer. I always have apples, bananas, onions and lettuce on hand. In the pantry is a huge variety of canned fruits and veggies. Your salsa looks delicious and I totally understand about having to break bad habits! My favorite vegetables to keep in the pantry are an assortment of canned beans and canned tomatoes. Lots and lots of beans and some fruit cocktail. What a great use of tomato. I always keep them in my pantry, plus peaches, pineapples, and sweet corns. Can’t wait to try this one. Apples, bananas and carrots are the essentials! That salsa looks really delicious. I love stocking up in corn, tomatoes, and green beans. Okay, this looks amazing. Josh and I love snacking on blue corn chips and salsa or crackers and brie cheese. It’s kind of our Downton Abbey snack 🙂 I’m going to try your recipe out next time though 🙂 PINNING! I keep a lot of canned beans — waxed and green. We like to eat them plain and I also use them for Three Bean Salad. I love canned corn, Mrs. Grimes Chili Beans, tomato juice and stewed tomatoes!!! I keep tuna and green beans on hand at all times. Stewed and diced tomatoes, green beans, wax beans, corn, and pears. I love to keep canned tomatoes and beans on hand as well as some pineapple and craisins. I always have canned tomatoes, beans and baking essentials – flour, brown sugar, etc. I always have canned tomatoes and tomato sauce in the house. I always have whole and dices tomatoes for my recipes and tomato wedges to eat with saltines! I keep canned vegetables like corn, green beans, green peas and lima beans for a side dish or a pot of soup. I always have canned fruits peaches for a quick cobbler, pears for a salad and pineapple for a casserole. I am always prepared. I keep a lot of tomatoes. Can this count as both a vegetable and a fruit? I’m going to use some of my supply to make this salsa. We love to keep corn, carrots, and peas on hand, and canned peaches and pears are a must with a 3-year old in the house. My favorite is pineapple canned in juice which I use to make smoothies. Corn, fire roasted tomatoes and pineapples. We love to stock up on canned peaches, fruit cocktail, corn, garbanzo beans, waxed beans and my favorite, sliced beets. For veggies – bell peppers of all colors, carrots and celery, onions, and for fruit usually bananas, apples and oranges. Canned Mexican tomatoes and Rotel. That’s it ! Canned tomatoes, beans of all kinds, peaches, pineapples and mandarin oranges. I like having peaches and pineapple on hand for easy fruit dishes. I like to have cans of peaches and corn on hand! I always keep canned tomatoes on hand!! I always have canned tomatoes, artichokes and cannellini beans in the cupboard ! I love having canned peaches and pineapples in my pantry!!! I keep canned corn, canned tomatoes, canned green beans and black beans in my pantry. We always have tomatoes, black beans and corn in the pantry. My favorite fruits and veggies to have in the pantry are peas, green beans, apricots, and peaches. I love to stock up on canned green beans and pineapple chunks. We always stock peaches, pears, pineapple, corn, green beans, and diced tomatoes. 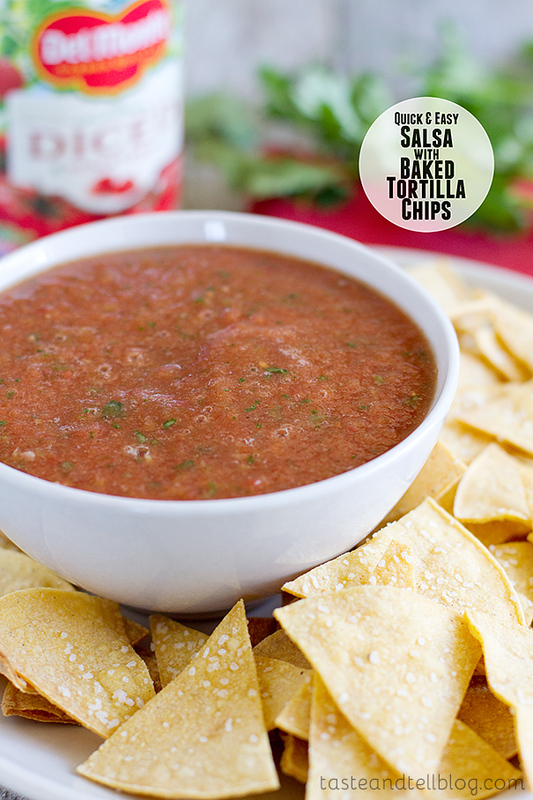 Thanks for the quick and easy salsa idea – looks delicious! I always have canned tomatoes, pineapple, and green beans in my pantry. Me too….my favorite to stock are diced tomatoes. I have to try that salsa recipe. It looks so good. I like to keep a variety of tomatoes, corn and green beans as well as canned fruit like my favorite, peaches. i don’t keep it in my pantry, but i always have broccoli and apples! I like to have potatoes and onions in my pantry. I find it useful to keep vegetable stock around also. 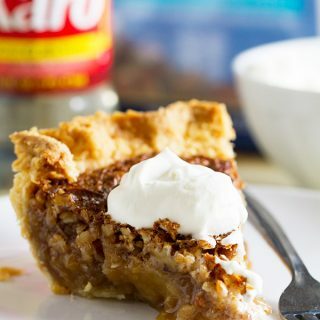 I love to keep a can of fried apples on hand for those impromptu country breakfasts! I like to keep lots of canned tomatoes in my pantry. We always keep tomatoes and pineapple handy. Diced tomatoes and beans for the perfect chili, especially during the cold winter! I keep tomatoes, beans peaches and pears stocked in my pantry. I like a chunkier salsa. Would drain the tomatoes and use as is.